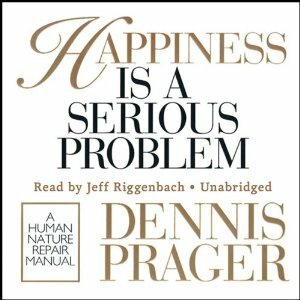 I do a lot of reading-both fiction and non-fiction-and in her book, Knit Together, Debbie McComber referenced Dennis Prager’s book, Happiness is a Serious Problem. The title alone intrigued me and I logged onto the local library site to borrow it only to learn no copy exists in South Dakota and that I needed to complete paperwork to do an inter-state loan from Montana. My interest was only heightened by this news: was it banned? Why was no one in South Dakota reading it? To date, it remains the book I’ve quoted more lines from than any other. In my opinion, it should be required reading, especially for individuals going through passages in life-like graduates or newly engaged, widowed or divorced individuals, etc. No matter where you are in your life or what you may be attempting to understand, this read will urge you to question your thought pattern and behaviors. Get the book, read it, take notes and share your comments, thoughts and feedback here. I’m curious to see how it impacts you. Expectations lead to unhappiness; minimizing them is realistic and desirable. They undermine gratitude, which is the key to happiness. Adults shouldn’t need unconditional love and we shouldn’t seek it. Adult love is never unconditional. There are-and should be-conditions under which a spouse’s love can be lost. Little is more destructive to happiness than perceiving yourself insulted when in fact you weren’t. There is little correlation between the circumstances of people’s lives and how happy they are. The one thing we can all control is our reaction to things. Attitude and philosophy of life determine happiness. A philosophy of life is what determines how happy or unhappy we will be. It will do more to determine a child’s future than almost anything else a parent can give. The notion that “everything turns out for the best” is nonsense. Tension is necessary for all growth and the more involved in life, and the richer your life, the more tension you will experience. Tension is a sign of vibrancy. “There are no free lunches.” Milton Friedman, Economist “Everything has a price.” Make peace with this and determine what price you will pay for what you desire. Choose to pay or forego your desire. It should be obvious that if human nature is the single greatest obstacle to happiness, controlling our nature is the single greatest step toward happiness. Yet, self-control is rarely stressed. Happiness is impossible without self-control. A happier life necessitates finding and making close friends. Friendship is impossible without shared values. Avoid choosing friends based on personality but look at character-their values-before you trust them. The people we bring into our lives are a mirror of ourselves. Some people use religion as a mask to cover the psychological wounds that they refuse to look at. When used as a shield against knowing oneself, it is a false use of religion that ends up distorting it. Copyright. May 2015. Linda Leier Thomason. Wow!!! I just may copy this and turn it into a poster I can hang in my house! Truer words have seldom been spoken. Thanks for sharing! This was one of the most level-headed, practical books I’ve ever read. If you read it, let me know what you thought. I did just what you are suggesting. I typed these 10 and more and shared with Ken and Alex to refer to often. It’s a guide to life as far as I’m concerned.